Christmas is right around the corner, and so are all of the holiday parties and family get-togethers. Chances are you are scrambling to find the most decadent desserts, elegant appetizers, and main courses to make the taste buds tingle. For Thanksgiving, I added what I hope will become a new tradition to our holiday celebration: a delicious pie from Edwards Desserts. 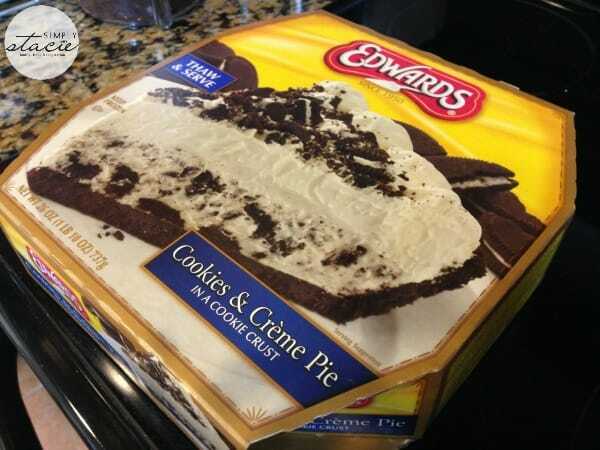 Edwards Dessert can be found in the frozen foods aisle of many retailers, and there are many varieties of pies that will appeal to everyone in your household. For the chocoholics, there is: Turtle Pie, Hershey’s Créme, and Cookies and Créme. For those who enjoy lighter flavors, they should try: Banana Créme, Strawberry Créme, or Lemon Meringue. My sister-in-law chose the flavor for Thanksgiving (Turtle Pie), and within minutes of slicing it, several of our family members were requesting slices of that instead of traditional pumpkin pie. Locate an Edwards Dessert retailer near you to experience dessert on a whole new level. Edwards Dessert began in the 1950s as a brick-and-mortar bake shop in Georgia, and in the 1960s the owner of the shop, Tom Edwards, expanded the business by pre-baking the pies and selling them to local grocery stores to be placed in the frozen food aisle. This proved successful; in the 1970s, individual frozen slices began to show up on the shelves and I’m so glad they did! My husband and I have very different tastes for desserts and rarely agree on a particular flavor. The individual slices are perfect; my local retailers only sell them as two-packs, so I buy them to enjoy one immediately and to have another slice for a different day. This is so convenient for shoppers who want to try out several flavors to find the ones they like best, or who don’t want to keep too many sweets at home at a time. Out of all of the varieties that Edwards Dessert offers, I’ve now tried a total of five flavors: Cookies and Créme, Key Lime, Reese’s Créme, Turtle, and Hershey’s Créme. All of these flavors are delicious, but my absolute favorite is the Hershey’s Créme. If you have ever ordered the Hershey’s Créme pie at Burger King and loved it, then you know exactly what I’m talking about. Although the Edwards Dessert whole pies are extremely affordable, this was my first time bringing home whole pies. To appeal to my husband’s taste, the first pie we brought home was Key Lime. 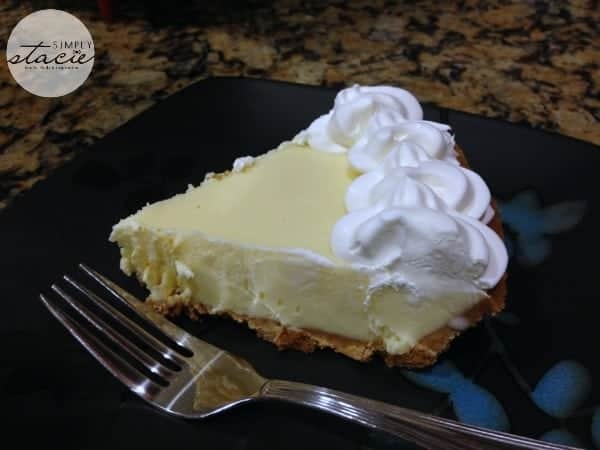 The Edwards Dessert Key Lime is light and fluffy with a creamy texture, not dense like the Key Lime pies that dine-in restaurants offer. If you like a light, creamy texture, you will want to give this one a try. The second pie I had my husband bring home was the Cookies and Créme. On a Valentine’s Day date several years ago, my husband actually purchased the two-pack of Cookies and Créme for our dessert. That was my second experience—Burger King having been the first—with Edwards Dessert and I loved it. I wanted to try the Cookies and Créme again after all these years and was just as impressed with it. Perhaps the best thing about the whole pies is that you can choose to thaw the entire pie (thaw times vary based on the flavor) or you can cut out one slice at a time. I was glad to find this out because sometimes there are fantastic savings on the whole pies at our local retailers, and it’s actually a better deal to take home the whole pie. I love their pies. Cookies and cream is my favorite. My father and I love Edwards Pies! When you come to our house I guarantee there will be 1 or 2 in the freezer. The Turtle Pie is the best to me! My dad loves the Lemon and Lime. Unfortunantly I have been on a diet and reframeing from my Edwards is near impossible! We love the Edwards Desserts Pies !!!! Sure hope we win !! So we can eat more pies !!!!!!!!!! I JUST bought an Edwards Pie — my first — and will be serving it at our NYE party. I absolutely love the key lime pie!